They say that everything's bigger in Texas — and apparently, that includes the feuds. On Monday, Politico reported that Lone Star State resident and former President George W. Bush had told donors at a fundraiser for brother Jeb's presidential campaign that he was no fan of a certain sleek-haired Texas senator, surprising at least a dozen or so guests with his candor. 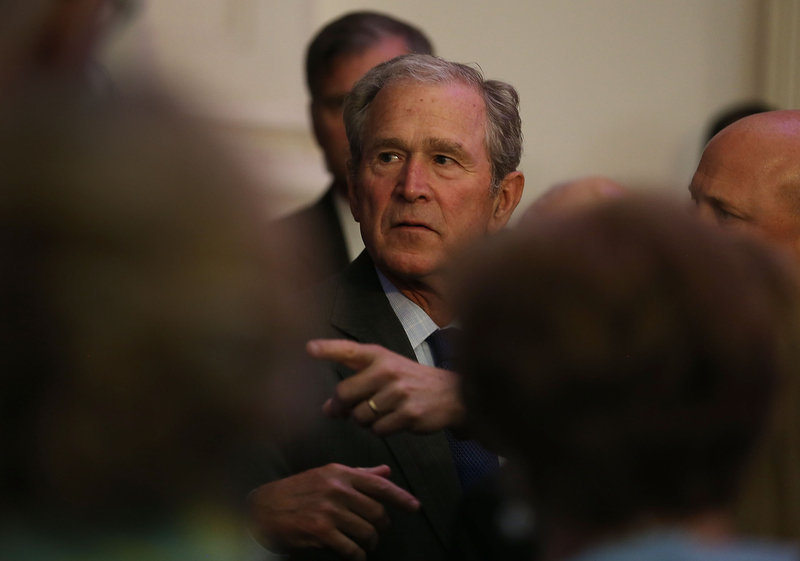 According to one of the attendees who spoke to the political news outlet after the event, George W. Bush said he didn't like Ted Cruz, the 2016 GOP candidate who is currently sitting in fourth place in the polls, just ahead of Bush's brother Jeb according to an aggregate by Real Clear Politics. "I just don't like the guy," Bush allegedly told the small group of guests, when asked about his views on the current GOP primary race. A source told Politico that Bush had "pleasant" things to say about most of the other candidates, but that his tone shifted noticeably when Cruz's name was mentioned. "He said he found it 'opportunistic' that Cruz was sucking up to Trump and just expecting all of his support to come to him in the end," said another source. In response, Cruz's camp finally released a statement Monday night after first refusing to issue a comment to Politico, stating that the senator had "great respect" for the former president, having once worked on his 2000 campaign and within his administration. "It's no surprise that President Bush is supporting his brother and attacking the candidates he believes pose a threat to his campaign," Cruz said. "I have no intention of reciprocating." Cruz added that he met his wife, Heidi, while working under Bush and that he would "always be grateful." Cruz, who has been on the GOP trail since March, has been something of an anomaly within the candidate ranks: He's largely escaped the wrath of frontrunner Donald Trump while still managing to carve out a right-wing niche for himself. As far as successful campaigns go, Cruz seems to have everything he wants at the moment. Unfortunately, much of that rise has come at a price. In order to siphon off Trump's energy, Cruz has had to back much of the platforms on which Trump is basing his campaign — that includes the vehement Twitter battles, the misogynistic comments, and the senseless policy measures. Recently, the two have even forged something of a friendly alliance: in August this year, Trump and Cruz planned to visit the Mexico border together, although as The Daily Beast reported, a scheduling conflict ended up preventing Cruz from tagging along. Again in early September, Cruz and Trump joined forces once more, taking the opportunity to speak at a Tea Party rally on the west lawn of the U.S. Capitol. Together with other Tea Party leaders, the two harpooned President Obama's Iran nuclear deal, collectively calling it "the single greatest national security threat facing America" and "incompetent." The crowds ate it up and Cruz's numbers began to slowly build. With Cruz's attachment to Trump, Bush's recent commentary, then, isn't so surprising. For the most part, Cruz has sailed through the early half of the 2016 GOP primaries on Trump's coattails. On his own, with his trademark televangelist style and history of causing gridlock on the Hill (as he famously did with his 2013 Obamacare filibuster), Cruz might otherwise have a more difficult time garnering support. In a sign of troubles to come, Cruz's one-time conservative cohorts on the Hill, who up until this point have been watching his meteoric rise from the background, seem to have finally put a foot down on the Texas senator's far-right push, doing whatever necessary to keep him from dragging the remainder of the party down with him in 2016. In late September, during a Senate meeting to keep the government funded, Senate Majority Leader Mitch McConnell denied Cruz a protest vote that would have shut down the government over Cruz's pet project: defunding Planned Parenthood. "Even fellow Republicans denied him a 'sufficient second' that would have allowed him a roll call vote," Politico reported that evening, citing Utah Republican Mike Lee as the Cruz's sole supporter in the effort. Cruz was incensed. But the Senate dismissal was just the tip of the iceberg. If Cruz plans to continue down his current war-path, clinging to allies like Trump and disparaging the core of his party, he can expect plenty more similar maneuvers in the future. With that sort of stubborn refusal to work with anyone while simultaneously feeding the controversy machine, perhaps former President Bush wasn't wrong in distancing himself (and his brother) from Cruz as soon and as publicly as possible.